Terra Forming Terra: Did the Vikings use Crystal Sunstones to Discover America? Did the Vikings use Crystal Sunstones to Discover America? Somehow i do not think that the Vikings used sunstones to discover anything except to maintain a rough heading. Any direction as long as it is toward the setting sun lands you in America. Even then you are merely sailing in a primary current which also gives you orientation, perhaps not safely the first time around but certainly thereafter. Testing here shows us that in the worst conditions, a sunstone becomes useless and at the level it becomes useful, alternatives likely work as well or better. Thus in the end it is a promising curiosity among others that were used for navigation. I suspect that the lodestone was just as handy as well and its antiquity has never been defined well. Certainly knowledge of the lodestone appears to have come from the North. The key to discovery was always to find a way to sail into the current. That way escape was easy. If that was impossible then you really rolled the dice and hoped you had sailing power sufficient to retreat. Recall that the viking ship was a wonderful sailor and could likely out sail anyone else. This made it ideal for exploration. It is also a reminder just how brave Columbis was to sail as he did with what he had. Ancient records tell us that the intrepid Viking seafarers who discovered Iceland, Greenland and eventually North America navigated using landmarks, birds and whales, and little else. There’s little doubt that Viking sailors would also have used the positions of stars at night and the sun during the daytime, and archaeologists have discovered what appears to be a kind of Viking navigational sundial. But without magnetic compasses, like all ancient sailors they would have struggled to find their way once the clouds came over. However, there are also several reports in Nordic sagas and other sources of a sólarsteinn “sunstone”. The literature doesn’t say what this was used for but it has sparked decades of research examining if this might be a reference to a more intriguing form of navigational tool. The idea is that the Vikings may have used the interaction of sunlight with particular types of crystal to create a navigational aid that may even have worked in overcast conditions. This would mean the Vikings had discovered the basic principles of measuring polarised light centuries before they were explained scientifically and which are today used to identify and measure different chemicals. Scientists are now getting closer to establishing if this form of navigation would have been possible, or if it is just a fanciful theory. To understand how this might have worked, we need to understand some things about the way light, and particularly sunlight, can be affected. Light coming from the sun is scattered and polarised by the atmosphere. This occurs when light is absorbed and re-emitted with the same energy by air molecules and by different amounts depending on the light’s wavelength. The blue end of the light spectrum is scattered more than the red, as explained in theory developed by the British physicist Lord Rayleigh in the 19th century. Scattering by particles in the atmosphere explains why the sky appears blue . More importantly, scattered light waves are also polarised to a certain extent. That means they vibrate in one plane rather than in all directions at once. The amount of polarisation a beam of sunlight undergoes depends on its angle to the viewer and whether the light has been further scattered by cloud and other particles that cause depolarisation. Around the coastline of Norway and Iceland are found crystalline chunks of calcium carbonate known as calcite or Iceland spar. When polarised sunlight enters a calcite crystal, something very interesting happens. Calcite is strongly birefringent, meaning that it splits light passing through it into two separate waves that are bent or refracted in different directions and with different intensities, although the total intensity will be constant. 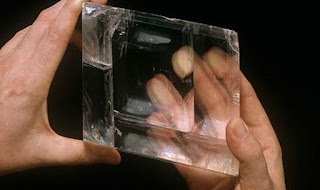 This means that objects viewed through a calcite crystal appear in double. More importantly for our purposes, the different intensities of the two light waves depends on how the original light is polarised and the position and orientation of the crystal compared to the light source. Tourmaline and cordierite are crystals with similar properties, except instead of splitting light like calcite they are strongly dichroic. This means they absorb one component of polarisation more strongly than the other. Again, the dichroic properties depend on how the original light is polarised and the position and orientation of the crystal compared to the light source. So, in theory at least, examining how sunlight passes through one of these crystals – and appropriately calibrated – could be used as a guide for sailors to estimate the position of the sun. This could then allow them to determine the direction of geographic north – even without understanding the scientific principles behind these phenomena. If we make the huge assumption that the Vikings had these sunstone crystals on board their ships and, more importantly, knew what they were doing with them, the question this is whether the difference in the light would be detectable to their eyes? And would it be detectable with enough accuracy (after errors because of imperfections in the crystals and depolarisation), to be used as a navigation aid even in overcast conditions. The latest in an impressive roster of publications on the subject recently appeared in Royal Society Open Science , seeking to address this precise question. Gabor Horvath and his colleagues looked at whether the optical signals from these three types of crystal would be strong enough to be detected and with enough accuracy to predict the position of the sun under a cloudy sky. To do this, they simulated the conditions, including the position of the sun, of a Viking voyage between Norway, southern Greenland and Newfoundland. They found that in clear skies, where the degree of polarisation was high, all three crystals did show sufficient signal and good accuracy. In light cloudy conditions where the degree of polarisation was somewhat reduced but still relatively high, cordierite and tourmaline functioned better than calcite. Only very pure calcite (with optical impurities removed) performed to a similar level as the other two crystals. If sunlight polarisation was very low, calcite appeared to give the best results in predicting the sun’s position through clouds. And in thicker cloudy conditions or fog, the errors of measurement became too high for all three crystals. Horvath’s team are now looking at the further errors involved in predicting the position of geographical north using this information. If the method does not work under cloudy conditions when using the kind of imperfect crystals the Vikings would likely have possessed, the whole theory is probably wrong. And on clear days it would have been easier just to use calibrated sundials. But if the researchers establish that sunstones could have accurately been used to determine the direction of geographic north, then the idea looks feasible. Then all that will remain to finally prove this fascinating theory will be to find a Viking ship with a calibrated sunstone in it. That, however, may take some time.